APEX, the Atacama Pathfinder EXperiment telescope, is located at 5100 metres above sea level on the Chajnantor Plateau in Chile's Atacama region. 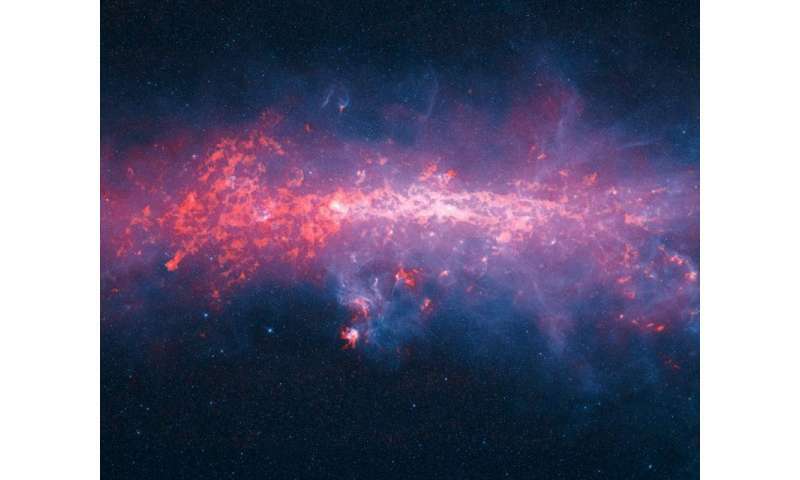 The ATLASGAL survey took advantage of the unique characteristics of the telescope to provide a detailed view of the distribution of cold dense gas along the plane of the Milky Way galaxy. The new image includes most of the regions of star formation in the southern Milky Way. The new release of ATLASGAL complements observations from ESA's Planck satellite. The combination of the Planck and APEX data allowed astronomers to detect emission spread over a larger area of sky and to estimate from it the fraction of dense gas in the inner Galaxy. The ATLASGAL data were also used to create a complete census of cold and massive clouds where new generations of stars are forming. "ATLASGAL provides exciting insights into where the next generationof high-mass stars and clusters form. By combining these with observations from Planck, we can now obtain a link to the large-scale structures of giant molecular clouds," remarks Timea Csengeri from the Max Planck Institute for Radio Astronomy (MPIfR), Bonn, Germany, who led the work of combining the APEX and Planck data. Leonardo Testi from ESO, who is a member of the ATLASGAL team and the European Project Scientist for the ALMA project, concludes: "ATLASGAL has allowed us to have a new and transformational look at the dense interstellar medium of our own galaxy, the Milky Way. The new release of the full survey opens up the possibility to mine this marvellous dataset for new discoveries. Many teams of scientists are already using the ATLASGAL data to plan for detailed ALMA follow-up."